Louis-Jean-François Lagrenée (1725–1805), Caesar's Remorse at the Death of Pompey (1767), oil on canvas, 41.5 x 33.5 cm, Zamek Królewski w Warszawie, Warsaw, Poland. Wikimedia Commons. History is often neither fair nor kind. In this next pair of Plutarch’s Lives, the memory of the first, the Spartan king and general Agesilaüs, has been lost, but the Roman general Pompey is now far better known. This is reflected in their depiction in art, so I have bundled their accounts together in this single article. On his father’s death, the kingdom of Sparta passed to Agis, son of Archidamus; Agis’ much younger brother was never expected to succeed to the throne, so he was put through the Spartan agoge, years of tough training to turn him into a true Spartan warrior, despite his being lame in one leg. However, his older brother died when relatively young; Lysander, who had been Agesilaüs’ lover when they were both young men, advanced the case that Agesilaüs should become king. Agesilaüs had only just been crowned when the Spartans learned that the king of Persia was mounting a great military expedition to drive the Spartans into the sea. Agesilaüs was chosen as the leader of thirty Spartans, including his friend Lysander, who took charge of an army totalling six thousand to represent the whole of Greece. When they arrived at Ephesus, Agesilaüs and his old friend Lysander disputed the leadership, which caused resentment in the heart of Lysander at the way that he was treated. The king then led his troops against Caria, and into Phrygia, where they captured many cities. Recognising his shortcoming in cavalry, the king went back to Ephesus, where he assembled a larger cavalry force. Stronger than before, when the weather improved Agesilaüs fought the Persians under Tisaphernes on the plain of Sardis, and put the enemy to flight. For his failure, the Persians beheaded Tisaphernes and sent an envoy to Agesilaüs inviting the Greeks to return home. The Spartan then took his army back into Phrygia, where he was made head of the navy as well as the army. 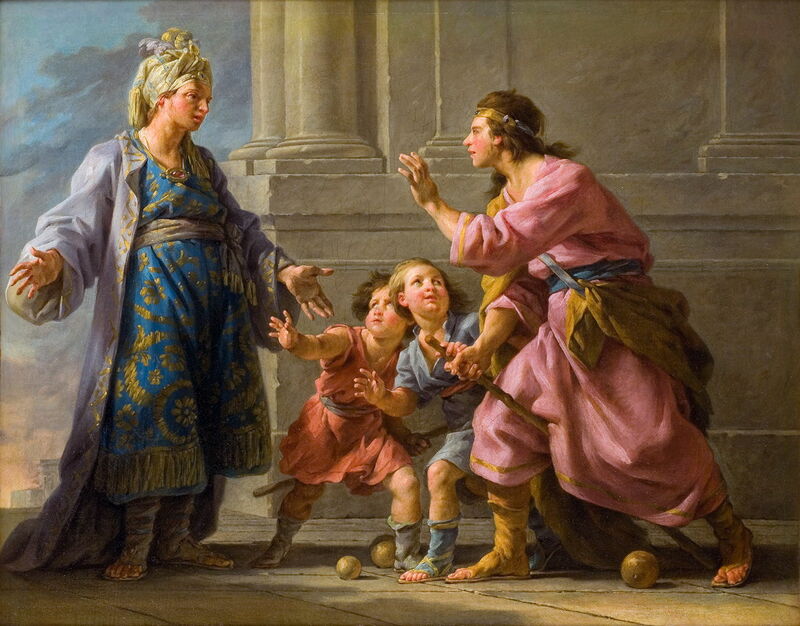 Noël Hallé (1711–1781), Agesilaus (1779), oil on canvas, dimensions not known, Musée Fabre, Montpellier, France. Wikimedia Commons. The only painting that I have seen of Agesilaüs is by Noël Hallé, and was completed in 1779. It shows the young king on the right, playing a game with two young boys, and talking to a leader apparently from the east. Its title of Agesilaüs give no clue as to which episode in the king’s life this might refer, though. Agesilaüs was putting the Greek cities in Asia Minor in order, when he heard that Sparta was at war with the rest of Greece, so he made haste to return home. His army crossed the Hellespont and marched on through Thrace. He received orders to invade Boeotia immediately, and with reinforcements from Corinth, he took his men through the famous pass of Thermopylae to enter Boeotia. Agesilaüs fought a fierce battle there, in which even he was wounded. He let the Theban enemy pass through his ranks, then turned and attacked their flanks, forcing them to withdraw to Mount Helicon. The following day, Agesilaüs made a truce with his enemy in which they effectively conceded defeat, so he went to Delphi to give thanks to the gods. When he returned home after more than two years away on campaign, Agesilaüs was unchanged, unaffected, and resumed life as normal. He led an army to Corinth, in conjunction with an attack by sea on its dockyards, when they were celebrating the Isthmian games there. Under pressure from exiles in his army, he provided security for the games to take place. Once his army had departed, the occupying Argives held the event a second time. Later the Spartans decided to make peace with the Persians, and handed over all the Greek colonies in Asia Minor, which Agesilaüs had fought so hard to protect. By this time, Agesilaüs was too old to fight, but involved himself more in matters of politics. He suffered problems with his previously healthy leg, and remained weak and unable to go out for a long time as a result of that coupled with excessive blood-letting as treatment. During this time, Sparta suffered many military defeats, the greatest of which was at Tegyra, where they were overpowered by the Thebans. The nations of Greece met in Sparta to discuss peace, which led to a stand-up row between Agesilaüs and Epaminondas over the independence of the cities of Boeotia from Thebes. As a result, the Thebans were excluded from the peace treaty, and war was declared on them. Within twenty days, the Spartans had again been defeated by the Thebans, and suffered heavy casualties. Epaminondas and his allies then invaded Spartan territory, and came close to taking the city of Sparta itself before they withdrew, possibly because of the onset of winter. Agesilaüs refused an offer of peace from the Thebans, so the Spartans were again challenged in war by Epaminondas, who almost managed to seize the city of Sparta when it was defenceless. A few days after the city was saved, Epaminondas was killed by a Spartan warrior during a battle near Mantinea, which enabled the Greek nations to finally come to a peace agreement. Agesilaüs went on one last military campaign, in Egypt. Although well past his prime, he distinguished himself in leading an escape from a fortified city under siege, then turning and driving his enemy into the canal which they had been constructing as part of their siege. Agesilaüs decided to return to Sparta. As it was then winter, his ships kept close to the coast of Libya. The king died there, at an uninhabited spot, at the age of 84. He was succeeded by his son Archidamus. Gnaeus Pompeius Magnus, known in English simply as Pompey, was and remains more famous that any Spartan king. Pompey’s father was Strabo, a highly successful general who was killed by a bolt of lightning; he was so hated that many heaped insults on his body as it was being conveyed to the funeral pyre. On the death of his father, the young Pompey was tried for the theft of public property, mainly in respect of items stolen by one of his father’s freedmen, but was acquitted. When he was only twenty-three, during the first of Rome’s civil wars, he found himself in the midst of an attempt by Carbo, a tyrant, to take over much of that part of Italy. Pompey put himself in command of the district, cleared the area of Carbo’s supporters, and led the local soldiers against rebel forces of Carinas, Cloelius, Brutus, then those of Scipio the consul. Pompey’s brilliant successes won him respect from Sulla himself, and the young man was sent to Gaul, where he was repeatedly victorious. For this, Sulla rewarded him with marriage to his step-daughter Aemilia. However, this required Pompey to divorce his first wife Antistia, who had recently lost both her parents, and Aemilia was in late pregnancy by her previous husband. Pompey was next sent with a large force to tackle problems in Sicily and North Africa. In this he was successful, and captured Carbo alive. Rather than having Carbo summarily executed, Pompey insisted on a formal trial, although the result was merely a short stay in his execution. Pompey went on to defeat the large army of Domitius in very poor weather, then to invade and subdue Numidia. When the tyrant Sulla ordered Pompey to return to Rome, he and his army distrusted his command, and Sulla heard initially that they were in revolt. When he heard the truth, though, Sulla rewarded Pompey with the name of Magnus ‘The Great’, and sent him to Spain as its pro-consul. However, he refused Pompey’s request for a triumph, telling him that only a consul or praetor was entitled to that, and that Pompey wasn’t even old enough to be a senator. Sulla then relented, and Pompey came to celebrate his first triumph. Gabriel de Saint-Aubin (1724–1780), The Triumph of Pompey (1765), watercolour, 20.8 x 39.2 cm, The Metropolitan Museum of Art, New York, NY. Wikimedia Commons. Gabriel de Saint-Aubin’s spectacular watercolour of this first Triumph of Pompey (1765) shows this unique event. Pompey had tried to enter Rome with his chariot drawn by four elephants, as shown here, but the gate was actually too narrow and he was forced to switch to horses. Lepidus was expelled from Italy, and died soon afterwards in exile on the island of Sardinia. Pompey was next sent to Spain as pro-consul, where he was again brilliantly victorious, although he had a close call in battle by the river Sucro, when he was wounded slightly so cut the hand off his opponent. Pompey had funded much of this from his own pocket, so sought the senate’s approval of public money. By the end of this campaign in Spain, Pompey had destroyed the armies of Perpenna, and when he captured his enemy, had him executed too. Pompey and his army returned to Rome, where the city was in the midst of its Servile War, its rebels being led by Spartacus. This was brought to an end by Crassus, but somehow it was Pompey who was given the credit, rewarded with a second triumph, and made consul. Following that, Pompey withdrew from public life. Rome was becoming more troubled by pirates at sea, who not only preyed on its ships, but also attacked its many ports and colonies from the sea. Pompey was given command of a large fleet to tackle this problem, and dispersed it to clear the pirates over less than three months. The most powerful of them had hidden their families in fortified villages in the Taurus Mountains, and themselves taken to the sea to await Pompey’s attack. There the pirates were soundly defeated, and either killed or captured. As a result, Rome gave Pompey what almost amounted to absolute power of command, putting him in a similar position to that attained by Sulla after he had siezed power as tyrant. This quickly brought Pompey into conflict with Lucullus: Pompey accused Lucullus of having love of money, and Lucullus accused Pompey of having love of power. Lucullus withdrew from Galatia, leaving Pompey to march against Mithridates, whose massive army deterred any plans of direct attack. Pompey finally closed on the enemy forces near the River Euphrates, where his most experienced officers urged him to press home immediately, while it was still dark. This paid off for the Romans, as the moonlight confused the enemy’s infantry, who misjudged the flight of their javelins. Mithridates was soundly defeated, although he himself managed to escape to Colchis. Master of the Geneva Boccaccio (fl 1448-1475), Pompey Holds Council with his Lieutenants Servilius and Glaucia (c 1470), illumination on parchment in The Book of Stratagems, 29 x 19 cm, Bibliothèque Royale/Koninklijke Bibliotheek, Brussels, Belgium. Wikimedia Commons. 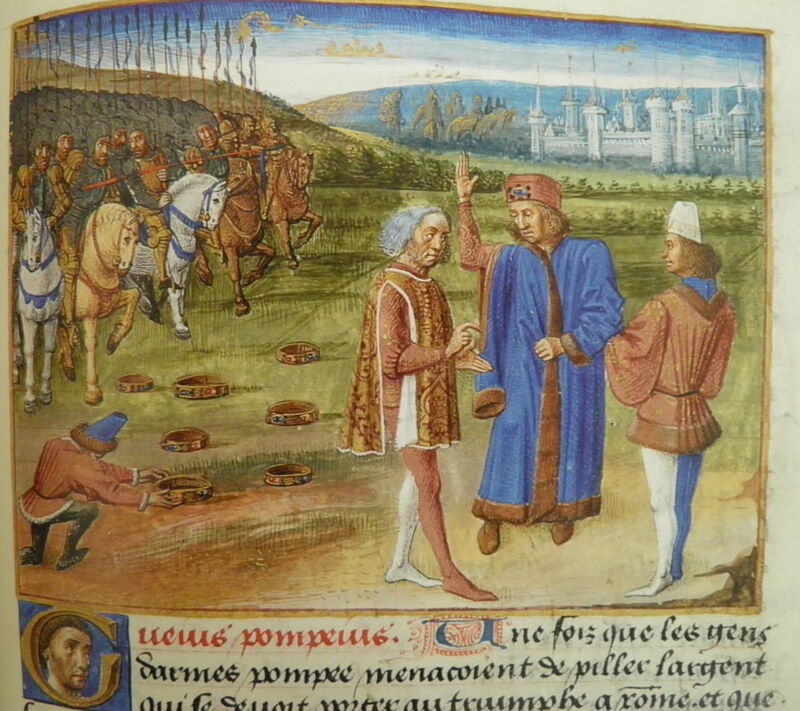 This illumination by the ‘Master of the Geneva Boccaccio’ from the Book of Stratagems shows Pompey Holds Council with his Lieutenants Servilius and Glaucia (c 1470). It is the more fascinating for its archaic approach to perspective: in the background are other soldiers attacking the fortified town, although there is a marked disparity in their size. Pompey moved on to capture Armenia, then into Georgia, where there is still a Roman bridge to mark his passing. Eventually, he gave up his pursuit of Mithridates, and turned south into Syria, where he heard of that king’s death. Jean Fouquet (c 1420–1480), Pompey Enters the Temple of Jerusalem (c 1470), media and dimensions not known, Bibliothèque Nationale de France, Paris. Wikimedia Commons. 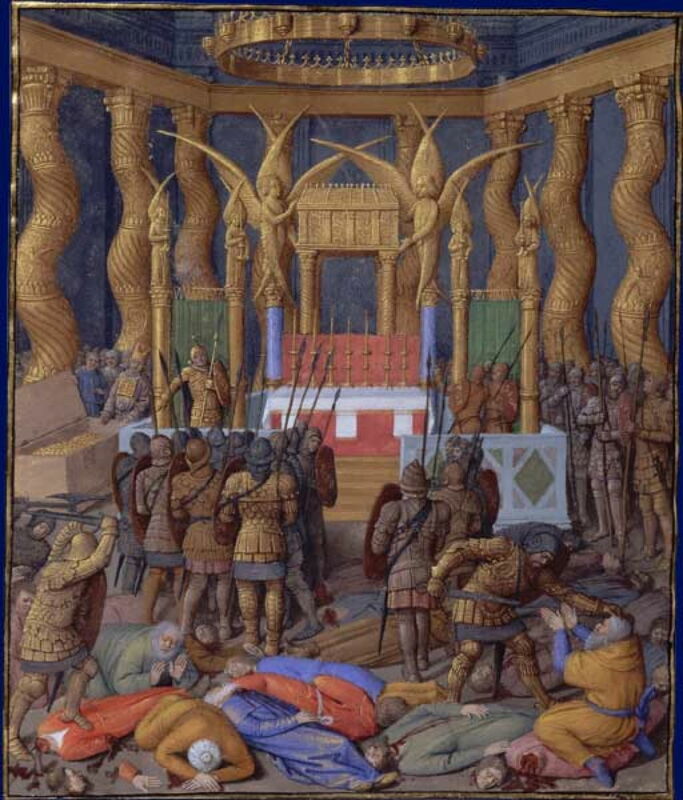 Plutarch doesn’t describe Pompey and his army entering the city of Jerusalem, but that is shown in Jean Fouquet’s painting of Pompey Enters the Temple of Jerusalem from about 1470. 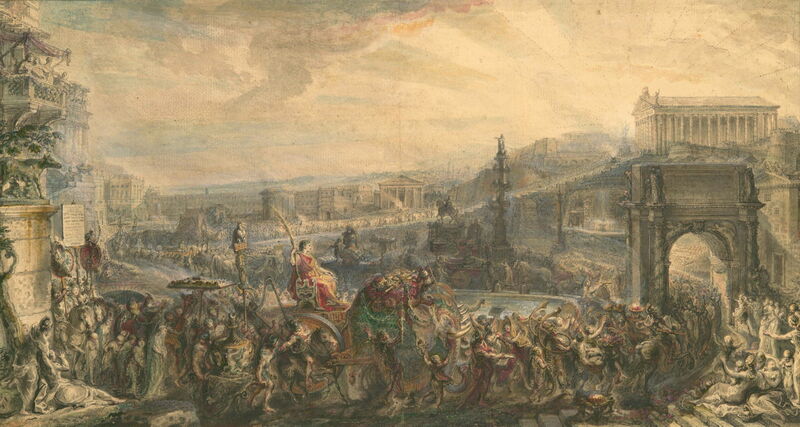 Pompey returned to Rome, but was forbidden from entering the city before his triumph. When he did enter for that event, the procession and celebrations were so grand that they took two days to complete. That was his third such triumph, which is not a record, although a great achievement for a man who was still under forty. After that, Lucullus returned, as did Caesar, who declared himself a candidate for his first consulship. Caesar and Pompey allied themselves when, to great surprise, Pompey married Julia, Caesar’s daughter, who had been engaged to Sulla’s son. The political situation became both complex and intense, ending with Pompey being made responsible for the administration and management of Rome’s vital grain supplies. While he was occupied securing a record surplus of grain, Caesar was elevated to greatness by his Gallic Wars. Taddeo di Bartolo (1362–1422), Caesar and Pompey (1414), fresco, dimensions not known, Palazzo Pubblico, Siena, Italy. Wikimedia Commons. 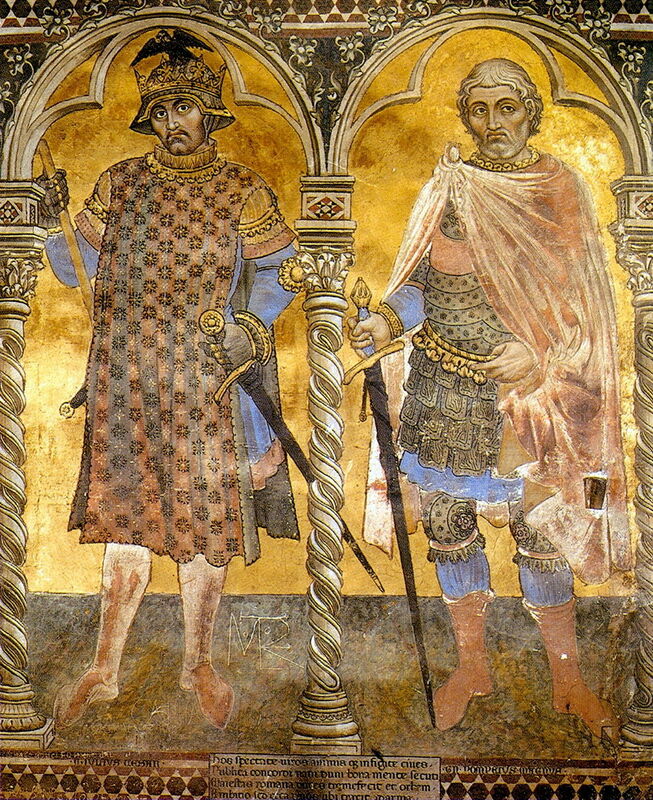 Taddeo di Bartolo’s double portrait in fresco of Caesar and Pompey (1414) shows what was often an uneasy relationship between the two great leaders. Pompey is on the right. Pompey’s young wife Julia died following childbirth, and Crassus died in Parthia, opening the way for a struggle for power between Caesar and Pompey. Word reached Rome that Caesar was marching on the city from Gaul with all his forces, so the senate asked Pompey to muster his army in defence. When Pompey responded weakly, people started abandoning the city in fear of what Caesar would do when he reached it. The consuls and Pompey fled, and a few days later Caesar entered Rome with far smaller forces than had been expected, and without the expected bloodbath. Caesar next set out in pursuit of Pompey, who by this time had reached the port of Brundisium, from where he fled to Dyrrachium. In sixty days, Caesar had become master of the whole of Italy, without shedding any blood, but he still wanted to go in pursuit of Pompey. Pompey assembled a great navy and army of which he took command, although by this time he was fifty-eight. Caesar proposed that the two should meet, disband their armies, and return together to Italy, but Pompey considered this was but a trap and proceeded to battle on the plain of Pharsalia. After a closely-fought contest, Caesar managed to rout Pompey’s infantry, and pushed on to victory overall. Pompey fled to the Vale of Tempe, from where he descended to the coast. Jean Fouquet (c 1420–1480), The Flight of Pompey after the Defeat of Parsale (c 1470-75), media and dimensions not known, Musée du Louvre, Paris. Wikimedia Commons. 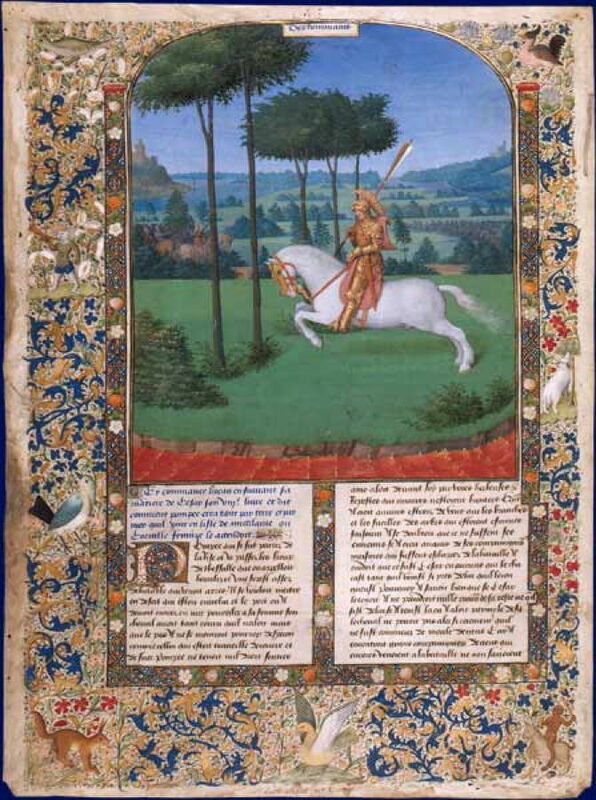 Jean Fouquet depicted this in his exquisite miniature showing The Flight of Pompey after the Defeat of Pharsalia, from abut 1470-75. At dawn the following day, Pompey boarded a boat, from which he was rescued by a larger ship. This sailed to Mytilene, where he was met by his wife Cornelia and son with whom he sailed on, finally reaching Egypt. As Pompey was drawing close to the shore, three of his companions killed him with their swords and daggers. He was then beheaded, and his body thrown into the sea. Artist not known, The Beheading of Pompey (c 1413-15), tempera colours, gold leaf, gold paint, and ink on parchment, 42 x 29.6 cm, J. Paul Getty Museum, Los Angeles, CA. Wikimedia Commons. 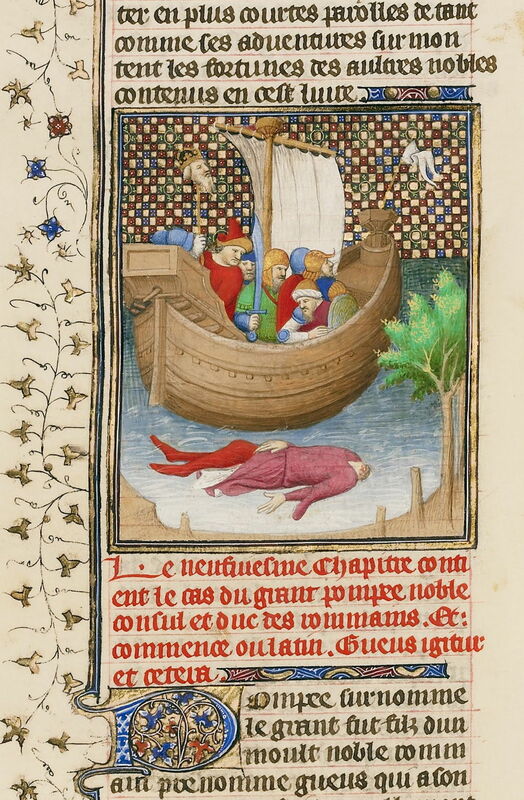 This anonymous miniature from about 1413-15 shows The Beheading of Pompey, with his headless corpse behind cast overboard, and the crowned head displayed on a pike. Caesar reached Egypt later. He turned away from the man who brought him Pompey’s head, wept when he was given Pompey’s seal-ring, and had his friend’s killers put to death. This final scene in the career of Pompey seems to have been a favourite with Stanislaus Augustus, the king of Poland. He commissioned at least two paintings telling this story, which today can be seen in Warsaw’s Royal Palace. Louis-Jean-François Lagrenée (1725–1805), Caesar’s Remorse at the Death of Pompey (1767), oil on canvas, 41.5 x 33.5 cm, Zamek Królewski w Warszawie, Warsaw, Poland. Wikimedia Commons. 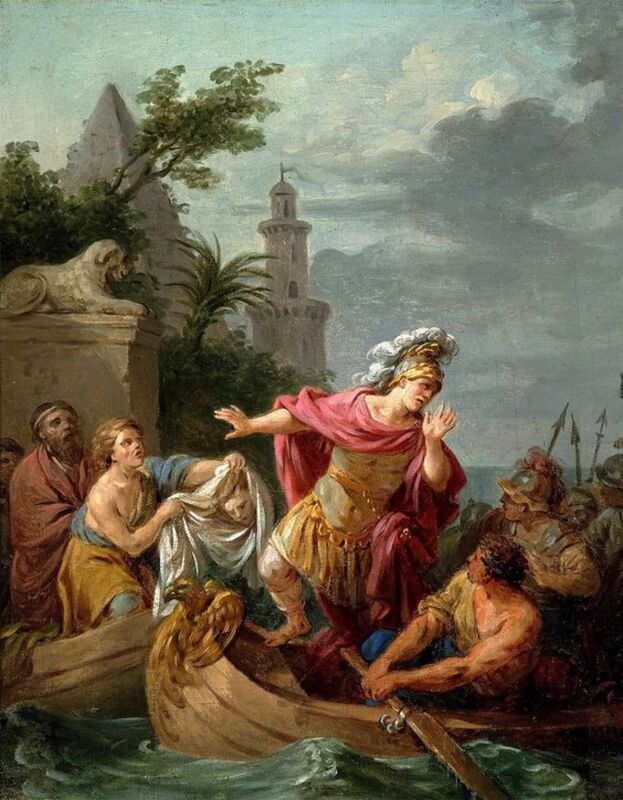 The first by Louis-Jean-François Lagrenée, titled Caesar’s Remorse at the Death of Pompey (1767), shows Caesar averting his gaze when he is shown the head of his friend and former son-in-law. 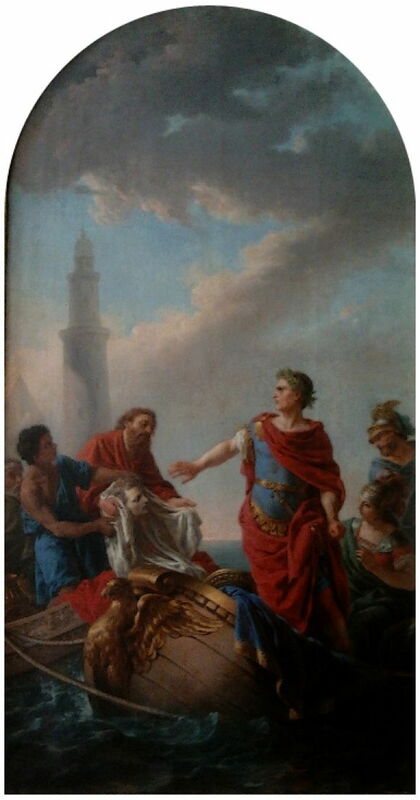 Louis-Jean-François Lagrenée (1725–1805), Caesar’s Remorse at the Death of Pompey (1767), oil on canvas, 29.6 x 15.7 cm, Zamek Królewski w Warszawie, Warsaw, Poland. Wikimedia Commons. Lagrenée’s second version of the motif is a different composition using the same basic figures and elements. This was exhibited at the Salon in Paris in 1767. Agesilaus, whole text in English translation at Penelope. Pompey, whole text in English translation at Penelope. Posted in General, Life, Painting and tagged biography, di Bartolo, Fouquet, Hallé, history, Lagrenée, morality, painting, Plutarch, Saint-Aubin. Bookmark the permalink.